ATK marches up against a hard-fighting Mumbai City at the Salt Lake Stadium of Kolkata, in the Friday clash of Indian Super League. The fixture that will be crucial in Mumbai's playoff hopes will be challenged by the Steve Coppell team with nothing much to lose. ATK had a calm and quiet start to the season but forgot the primary objective of goal scoring all through these months. Coming to the end of the league, ATK is the team with the least goals scored (15). A good defensive display, that lined up the compactness matching to the league leaders could earn them 5 wins only. Edu Garcia, the latest addition to the squad was a bit late in arriving to end the goal-scoring woes. The Kolkata club is placed 6th on the points table with 21 points from 16 games. Mumbai City was a team that ruled the league through the midway this season. However, the early magic they showcased hasn't lasted long as the side has lost 3 consecutive games at this crucial phase of the season. Three matches without a goal has struck the confidence of a well-built attacking lineup including Modou Sougou and Rafael Bastos. The Islanders, under Jorge Costa, remains at a firm spot but will have to address its faults quickly. Mumbai City is 4th on the points table with 27 points from 16 games. John Johnson will be suspended for a match following a fourth yellow card. Mumbai City does not have any injuries or suspensions. The key part of ATK's plans would be the Spanish attacker Edu Garcia. The team has had a complete shift of gears in attack since the 28-year old's arrival. Forming a good attacking trio at the front, Garcia has been relieving the club's worries and has justified his signing with 2 goals and an assist in 4 games. Mumbai City's hopes would rely on Modou Sougou and Rafael Bastos. Both the players who looked dull in their recent outings had their parts unfinished, which led to the team's defeats. 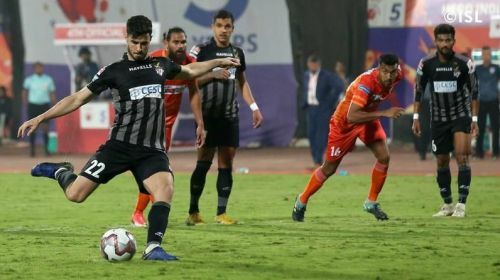 However, the 9 goals from Sougou and 3 goals from Bastos has saved the days for Mumbai on numerous occasions and would expect the same at Kolkata. Things would get interesting when a good, but out-of-form attack faces an improved offensive lineup. Mumbai City looks like the side more in need of a win, which might force them to alter the strategies to a safe leg. However, with Coppell too being in a balanced position, a draw can be expected at the end of 90 minutes.